CBVR has been easy and pleasant to work with. The staff is friendly and answers questions in a timely way. I feel that they realize that, though we are one of many vacationers they see each year, they understand that this is our ONE vacation and they try to make it as trouble-free and as pleasant as possible. That's why we like working with them. You are by far the best vacation rental company in cannon beach. We haves rented numerous homes over the last 20 years from many different outfits... But you guys are a delight! So organized, friendly, affordable, and your gift bag of coffee/mugs is a wonderful bonus! Beach is my favorite place and the weather was great and your company was there for anything we needed. Very cute house, and very nicely updated. We loved the nearness to the beach, and the quiet, relaxing community of Arch Cape. Very nice experience. Thank you. We absolutely LOVED our stay. Thank you SO much and the house was wonderful, the property was amazing. We couldn't have asked for more. I wish we could have stayed longer. Wonderful--really enjoyed the place and the people running the agency! I found your company's process to be very organized and efficient. What a great service you folks provide! I've had problems with other agencies at other locations, but you are very professional and easy to deal with. Always had quick and accurate answers during the reservation process. Handled the paperwork quickly and flawlessly. I appreciated the ability to handle the entire transaction electronically. I will certainly use you again on my next trip to Cannon Beach. 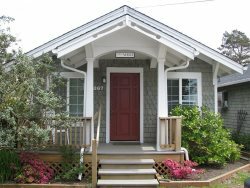 A charming beach house on a quiet street close to town and the beach, which is an excellent way to spend a vacation!